Regular maintenance and cleaning of your Rockford Separator will ensure that they maintain not only their optimal operating efficiency, but extend the life of the product as well. 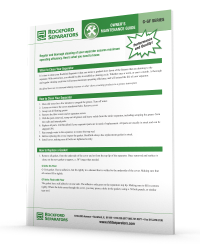 With that in mind, we have created maintenance guides that will walk you through the process of properly maintaining and cleaning your Rockford Separator product. As always, if you ever have a question about your Rockford Separator, feel free to contact us at any time, and we'll be happy to assist you.